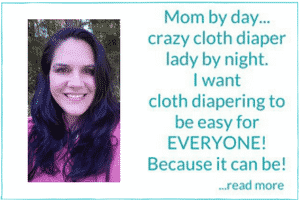 Love your Velcro Cloth diapers but hate the issues with them? Then you need to check this out! The other day I asked everyone on Facebook which they prefered: Snaps or Aplix? There were a good many people that said they loved snaps. But quite a few of those people added it was because of a few issues they had with Aplix. Before we get into why we are here today…. 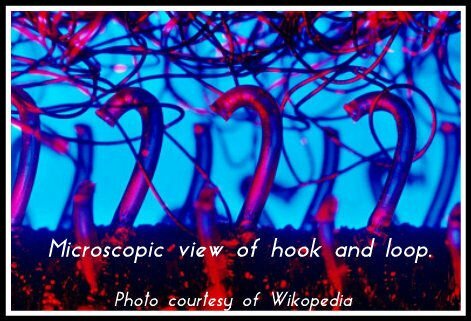 I would like to tell you a little bit about hook and loop. Convenient option for wiggly babies, easy to put on and easy to adjust. Most like a disposable diaper. This seems to make it easier for caregivers to use. Some diapers just don’t seem to stay closed even when they are brand new. Can wear out or become full of fuzz and lose its stickiness. Some people find it scratchy on baby. Many think it is too easy for baby to remove. Although I think once a toddler figures out how to undo Aplix, it will only be a matter of time before they figure out how to undo snaps. Laundry tabs don’t work well causing the DREADED diaper destroying chain in the wash.
First, you need to purchase a strip of loop fabric or touch tape. You can find it on Amazon here. It is called 1.5 Inch Touch Tape (I think touch tape actually works better than loop fabric because its thicker and seems more durable). Count your hook and loop diapers and multiply times 3. That is how many inches you need to purchase. I would get a little extra because lets face it, there will be more diapers, right? I’ve also found that the loop fabric squares curl a bit after many washes. So to be on the safe side just get a little extra. Once you get it, simply cut it up into 1.5” x 1.5” squares. I wasn’t very scientific when I made mine, just eyeballed the tape as best I could. I store them in a little container by the changing table. Ok, so how do you use them? 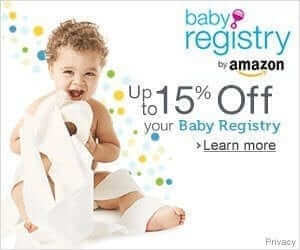 You won’t be using the provided laundry tabs on the diaper. You will use the loop tape square you made instead. Simply store clean diapers with squares on them. Remove just before you put diaper on baby. As a dirty diaper comes off, you simply reach for your little container full of squares and place on Aplix instead of using provided laundry tab. Throw into wetbag or pail. And done! 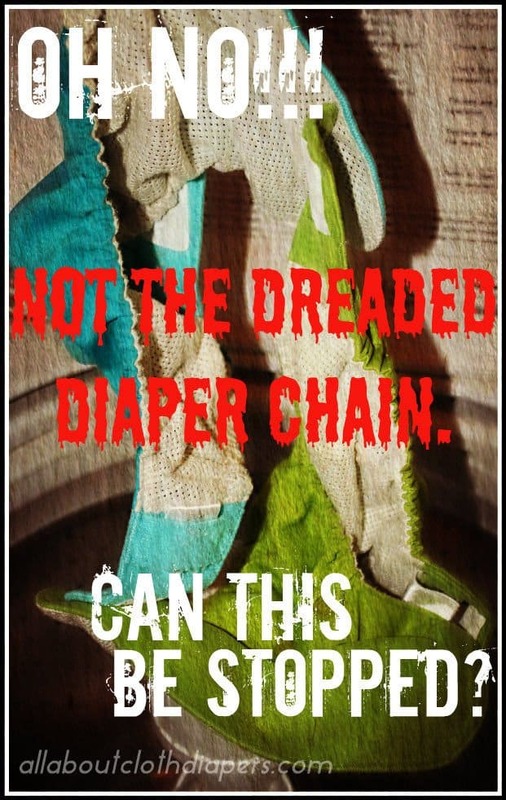 Watch in amazement as you no longer get diaper chains in the wash. Now for the best part! You know how the hook part of the closure gets all full of fuzz? YUCK!! You won’t have that problem anymore! Now that the tab is completely covered in the wash it will come out gunk free every time. So glad I came across this post! I just recently started adding Velcro closure diapers to our stash because my son just won’t hold still anymore and I actually love how easy they are to put on, much more convenient! I’ve been pretty good about closing the tabs before putting in my diaper pail but a few escape me now and then and create a mess! I’ll definitely be trying this trick out,I to hate the fuzzies in the tabs and when you have a house with 4 girl’s there’s bound to be hair in them!!! I love this idea. I washed my first load of cloth diapers for my newborn and now 7 have snags in the front (pocket diapers). Do you know of any tips to fix these? Are they likely to leak now? Thank you! The pulls are probably just superficial and likely only affect the way the diaper look. I unfortunately do not know of any way to fix them. 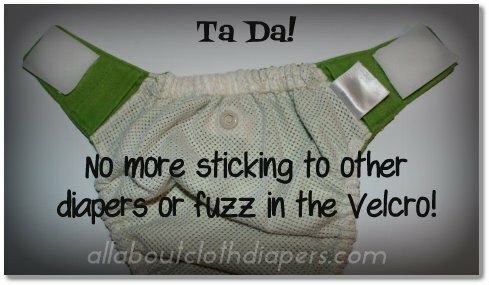 I found this tip a while back and tried using it on my h&l diapers for a while. I didn’t find it was that effective (I still got lint/fuzz), and it was more time consuming than anything, so I went back to using the laundry tabs (or with my GroVias I just did them up like they were on a baby, but inside out). I never really had a problem with diaper chains, as long as I used the laundry tabs properly. I have issues with lint, hair, etc. getting into the loop part as well as the hook part, so this method didn’t solve that problem anyway. I make cloth diapers and never realized I could save time not sewing in that extra piece of loop. Great idea. sorry dumb question but would you be buying the hook or the loop of touch tape? Thanks, Its all fixed now! AMAZING!!! Thank you so much!